Our care philosophy ensures that unique interests of individuals are at its core, where everyone is treated with dignity and respect. 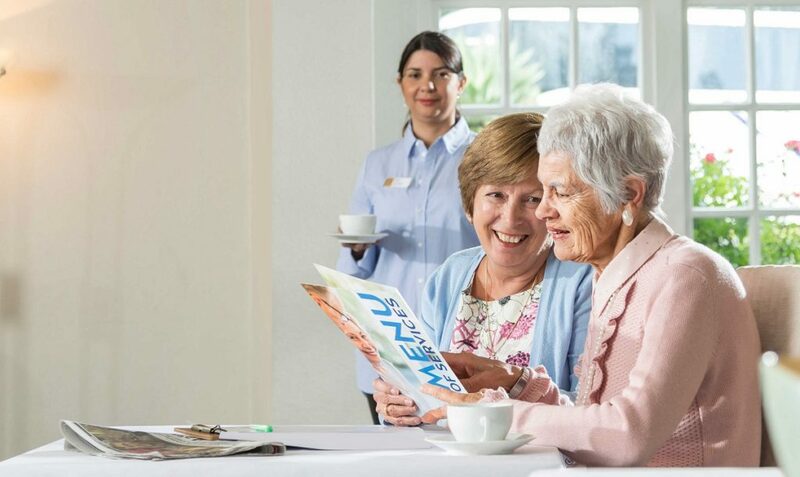 With an emphasis on quality of life we can provide rest home and hospital level care. View a list of villages that offer care homes below and select a village of your choice. You will have access to 24-hour care and support in a safe and comfortable environment with a Nurse Manager and team of registered Nurses and trained Caregivers dedicated to your well-being. Rooms within the care home can be decorated to represent a homely environment and are well equipped for your convenience and comfort with 24-hour push button assistance and heating. Many of our care homes can offer a hospital bed with pressure relieving mattresses and an ensuite toilet. Each room also has access to a recreational room, hairdressers, dining room and shared kitchen where you and your family can enjoy a cup of tea or coffee. We provide nutritious breakfast, lunch, dinner, morning and afternoon tea as well as cleaning and laundry services. Local doctors visit our care homes weekly and in between times for unwell residents. We work with our residents to reach their goals and provide on-going assistance with their daily activities. We are committed to restoring resident’s confidence levels, focusing on their well-being with better nutrition and activities to reduce social isolation.